Stéphane Marin has kindly donated the 2018 proceeds of the "Each Morning of the World" project to the WFAE. To express our appreciation, the WFAE has given him a free one-year membership. Thank you Stéphane, and we wish continued success for "Each Morning of the World." 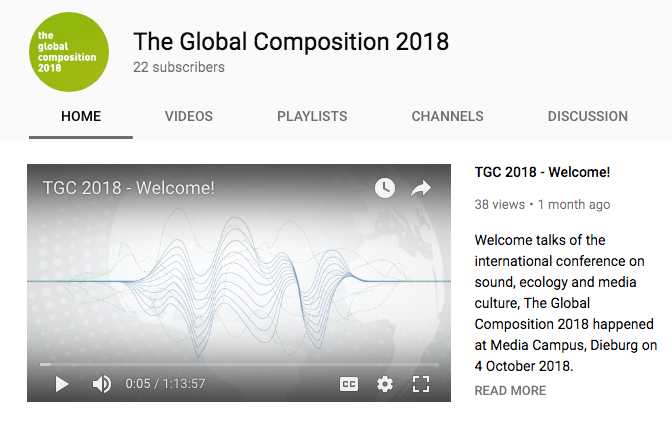 Video documentation of days 1 and 2 of The Global Composition 2018 Conference is now available on YouTube. Encouraging ongoing dialogue about what is relevant in acoustic ecology, such as increasing accessibility, diversifying voices, mobilizing knowledge, rethinking the concept of noise, retooling listening, increasing networking opportunities, better communication of core messages, coordination of volunteers to undertake tasks, etc. 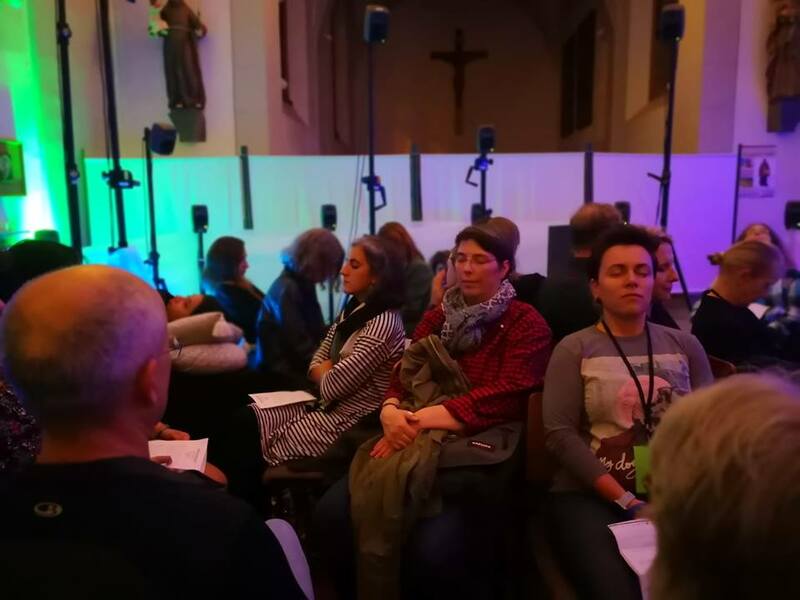 TOTW1993 was an initial mobilisation of the global acoustic ecology community, whereas TGC2018, and other similar events, are steps towards broadening this community into a listening and sounding culture. Gathering the discussions and yearnings of three generations of acoustic ecology scholars, the The Global Composition 2018 (TGC2018) was an opportunity to broaden and deepen our understandings on the diversity of listening, an experience framed by the impressive silence of the Mediencampus of Dieburg. How the Global North/South situation stood during the plenary sessions and also in the papers highlighting features, tendencies and gaps on valuation and legitimization of listenings closely connected to historical, cultural, political and human aspects of each country/region participating in the event. To consider the participation of scholars of urbanism as potential allies in the maturation and constant resignification of the global acoustic ecology studies. In order to extend the applicability of the Schaferian legacy, it is necessary to consider listening more as a politicized act: an invitation for acoustic ecologists to contemplate what is done with this listening. This goes through the comprehension of symbolic and decolonial dimensions, trans-sonifying the act of listening from a mere act of servitude and/or curiosity into a tool that facilitates the constitution and maintenance of holistic consciousness. Finally, including contemporary gender discussions and reports of victims of noise pollution, among others, opens space for unique and important opportunities to learn about the specificities of listening and helps scholars in the area to use and resignify scientific instruments in order to capture, understood and show good and real results. 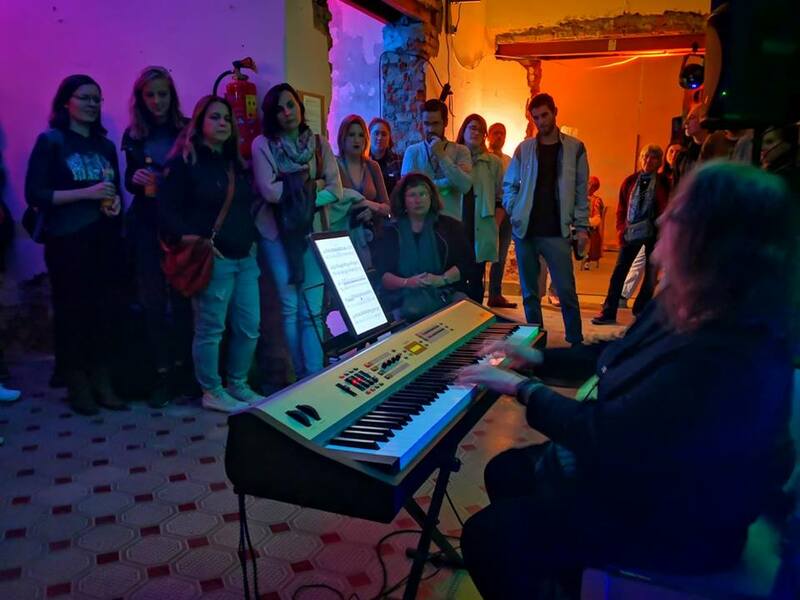 These are some notes on the TGC2018 that aim not only to contribute to the acoustic ecology initiatives initiated in Tuning of the World 1993, but also to discover ways of approaching the area in a diverse world and in need of discussions and studies about the sonorous that surrounds us and defines us as human beings. Dear Walter, On behalf of the World Forum for Acoustic Ecology in recognition of your lifetime of achievement in nature sound recording, for the great contribution this makes in scientific research and public enjoyment both, we would like to honor you as an Honorary WFAE member. I hope you accept our offer and thanks and enjoy being a member of our global network. Born 1934 in the town of Olomouc, now a part of the Czech Republic, Tilgner worked as an ornithologist and photographer since the 1950s. From 1981 until 2012 he was employed at the Bodensee-Naturmuseum in Konstanz, Germany. Now in retirement Tilgner remains active raising awareness on the changing soundscape of Europe's natural environments. Tilgner’s earliest published tape recordings date from the 1970s. With the advent of digital recording and Neumann microphones for binaural recording, in the late 1980s he achieved his long sought goal of producings recordings of great spatial depth and clarity representing the rich fabric of wildlife in the forests, lakes, marshes, and meadows of the region. His stunning recordings are part of the Programmarchiv of the European Acoustic Heritage project. Many of Tilgner’s other historic releases are in WERGO's Natural Sound series. A self-help book for hearing loss and related disorders, including a CD with Tilgner's audio recordings, is titled, Hören im Gleichgewicht (Listening in Balance), published by Vesalius Verlag. To order this book, to listen and to learn more, visit Tilgner’s website where you can also link to his recordings on Spotify and iTunes. The 2018 Conference of The Central European Society for Soundscape Ecology (CESSE) will be held November 28 - December 1, Budapest, Hungary. The CESSE proposes to established a new Central European WFAE Affiliate Organization. Click here for more information. The Global Composition 2018 - Final Program Now Available! ​The Global Composition 2018 conference (October 4-7, Dieburg, Germany) will begin with performances and installations at the Langstadt train station. The conference will feature keynotes by Milena Droumeva, Maria Klatte, and Walter Tilgner. There will be a celebration of the WFAE silver jubilee, with a participatory social sculpture. Click here for the final program. The WFAE Board welcomes new Affiliate Representative, Rob MacKay who has succeeded John Levack Drever as UK and Ireland Soundscape Community (UKISC)’s new Chair. The WFAE thanks John for many years of service as UKISC’s founder and WFAE representative. The founding conference of the Central European Society for Soundscape Ecology (CESSE) in Budapest has extended its deadline for submissions until September 15, 2018. The first international Conference of the Central European Society for Soundscape Ecology 2018 happens 28 November – 1 December in Budapest. CESSE Conference #1 is dedicated to the establishment of a new organization for convening and coordinating energies towards the improvement and care of the region’s soundscapes. The Society seeks to be part of the worldwide activities coordinated and guided by World Forum of Acoustic Ecology (WFAE), concentrating on the Central European region, specifically: Austria, Croatia, Czech Republic, Hungary, Poland, Romania, Serbia, Slovakia, Slovenia, but the conference is open for all people from any region. The registration fee of the conference is HUF 12.000 / €40 (€20 for students with school ID). Please visit https://cesse.mome.hu/ for more information.